This refers to the practice of cleaning off any external dust and clearing away any negative energy the crystal has absorbed. It is a way of being sure that the natural qualities of the crystal will be clear and fresh, both on the physical and on the metaphysical level, ready for healing use. To clean the surface of most crystals (tumble stones or ones that are not fragile or contain loose points), wash any dust or natural matter with tepid, soapy water and leave to air dry. To clear the crystal, there are several tried and tested methods, and it is best to choose the one that you are drawn to because it makes sense or resonates with you – aiding the process, as your intent and conviction will be stronger. Earth – Bury the crystal in soft, dry earth that will not damage it by scratching or releasing water to susceptible minerals. This method is used for deep cleansing, when other methods have not fully worked. Leave the crystal buried for a length of time that makes sense to you – a week, a month, a moon cycle, between full and new moon, etc. The crystal will need physical cleaning after and recharging underfull moonlight. Sound – Neutralise the crystal by sound vibration of the voice or an instrument, like a drum, singing bowl, bell or tingsha. 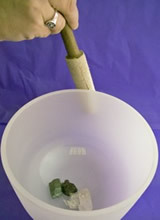 We place items for cleansing into our crystal singing bowls played with the intent of cleansing. Smoke – Pass the crystal through rising smoke of cleansing/purifying incense eg sage or sandalwood. Either pass the crystal through several times or hold it in the smoke for around 5 minutes. When using large sage, smudge sticks, you may need to cover any smoke alarms. Water – Hold the crystal in fresh running water for a few minutes. Suitable for crystals with that are not water soluble, (as a general rule, this means with a hardness of 6+ on Mohs Scale). Choose to do this in, or with water from, a place that it special to you because of your connection with the landscape. 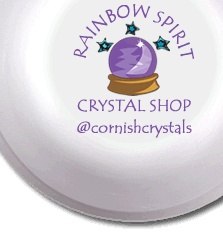 We use the streams of Bodmin Moor, putting the tumble stones into a clothes washing detergent tablet bag after several experiences of the water’s flow resulting in us gifting many crystals to the stream! Be careful with salt or salted water, because it can damage crystals that are not as hard as quartz. An alternative is to use uncooked brown rice and immerse the crystal in the dry rice for 12 hours, compost the rice afterwards. With each of these methods, it is helpful to visualise the gentle release and transmutation of the negative energy and focus on achieving cleansing with the highest intention for good. Recharge the crystal after cleansing by placing it in full sunlight or moonlight for 12 hours. Crystal Healing theory and practice can be utilized by practitioners of alternative therapies in many ways. To purify the waiting area or treatment room. A programmed quartz point or amethyst cluster to balance inharmonious energy and clear negative energy from the room. It is cleansed and reprogrammed regularly (once a week if it’s a busy practice). Ajoite or Sugilite can be used to transmute negative energy. Remember, it is the intent that is paramount – not the size or scale of your use. So smaller crystals are fine, or could be used away from the room itself, say on an altar/shrine/private space for you, with a crystal grid laid out over a photo of your healing room. This may be more practical if you use a room away from home, or that is not solely for your use. In self-development through dream recall and mediation. Smoky Quartz points placed one in each corner of the room will direct negative energy away from the therapist. An Onyx will absorb negative energy, which then needs to be released safely elsewhere. Prehnite aids being sympathetic without being empathetic – so the therapist avoids ‘taking on’ too much of the client’s mental/emotional state. As a diagnostic tool. Have a bowl of tumble stones in your waiting room, or therapy room for client’s to select from as they wait for their treatment. The stone that they intuitively pick will provide interesting information about their state. For chakra balancing during the treatment. For crystal healing during the treatment. As a tool for gaining feedback between sessions. For example, lending or giving the client a crystal to carry with them or to meditate with. Ask them to make notes on their experiences to share with you at the next appointment. Reiki can add another dimension to working with crystals, for example by using Reiki healing and symbols when charging or programming a crystal. 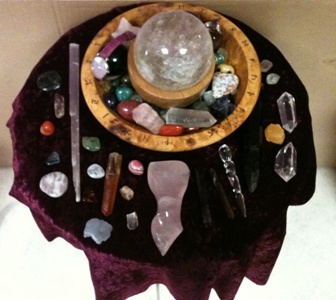 Often a Reiki practitioner will use a crystal grid of six quartz points surrounding one central crystal. The centerpiece can be a sphere, a cluster, pyramid or an egg shape. Alternatively, some people prefer a Generator Crystal, which is a Clear Quartz point that stands on its own base, and has perfectly equal faces on its seven-pointed termination. We are always on the lookout for these to have a supply when called for. In a Reiki grid, each crystal is charged with Reiki energy before 6 of the points are placed in a circle with their points facing inwards, and the centre crystal in the middle. The circle can be as large as you wish and is practical for you. The grid is then used for sending Reiki energy by placing within the grid, photographs, names written on card, affirmations. The 7th or 'master crystal' is then charged with Reiki using the intention that the grid continuously send Reiki to everything listed or pictured in the grid.